This plastic knob accepts a 6mm shaft and has a 15mm outer diameter. They simple press-fit onto a shaft. These are clear so that they can be used with our illuminated rotary encoders. The LilyPad MP3 Player is an amazing little board that contains almost everything you need to play audio files. 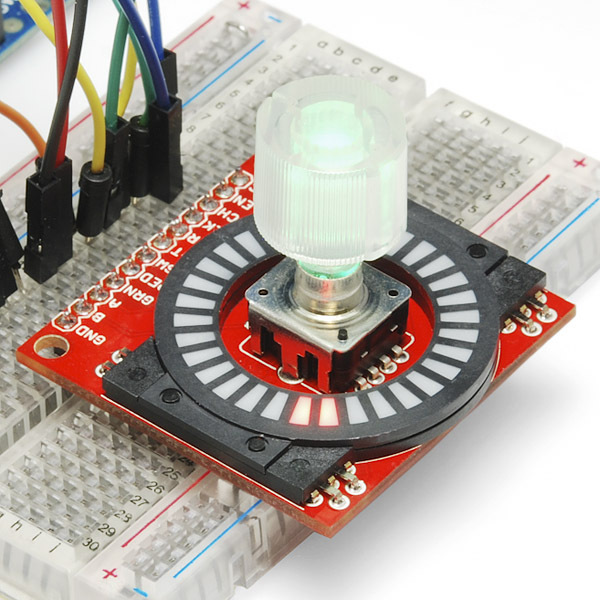 You can use it to create all kinds of noisy projects, from MP3 hoodies to talking teddy bears. Your imagination is the only limit! This tutorial will help you get started. These make an awesome diffuser for RGB LED's! Can these be removed from the encoder once attached? I've pulled hard enough that I am concerned that I might damage the encoder, but the knob is stuck pretty good. I've always been able to get them back off. I'm sure I've removed four different knobs from encoders dozens of times. I have had to pull pretty hard a few times. Despite both having a 6mm shaft, this knob does not in fact fit on the (non-illuminated) rotary encoder COM-09117. It is fairly small, and while it was meant to be used on a rotary switch that SparkFun is selling, it also fits perfectly on Alpha Pots with a clear shaft. let's all give this knob a round of applause, shall we? This is a nice knob, but does not fit on my 6mm-shaft encoders. :( Maybe a bad batch? Waiting on customer service to respond. Hi, I tested these with some of our 6mm potentiometers and it fits perfectly. Your encoders might have a different spline count as compared to these knobs. Also, please contact us directly if you have future support questions.